New Life Community Church, the joint ministry of Luling United Methodist and First Union Presbyterian, recently hosted a summer vacation bible school program. The church had nearly 100 children and more than 50 youth and adult helpers in attendance. Attendees learned about God’s love and how to put that love in action. One of the ways they were encouraged to put God’s love into action was by donating flip flops for the church’s Nicaragua missions team. 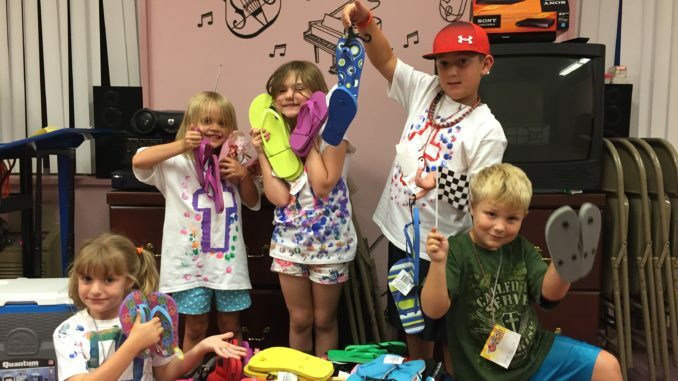 Throughout the week, children brought in donations and more than 130 pairs of flip flops were collected to be given to individuals in Nicaragua when the mission team travels there in February.